The Welshman missed most of 2018 but he is now back running and chats about his recovery process. When Dewi Griffiths stormed to an astonishing 2:09:49 marathon debut in Frankfurt last winter, his performance reignited the perpetually heated discussions about the state of modern British endurance running compared to its ‘heyday’. 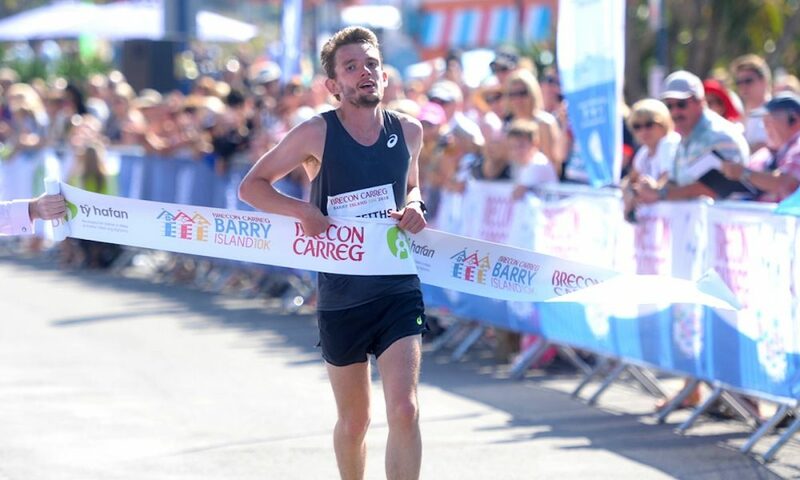 However, injury was set to cruelly strike the Swansea Harrier down just weeks later at the end of 2017, bringing to an abrupt halt his most successful year yet. 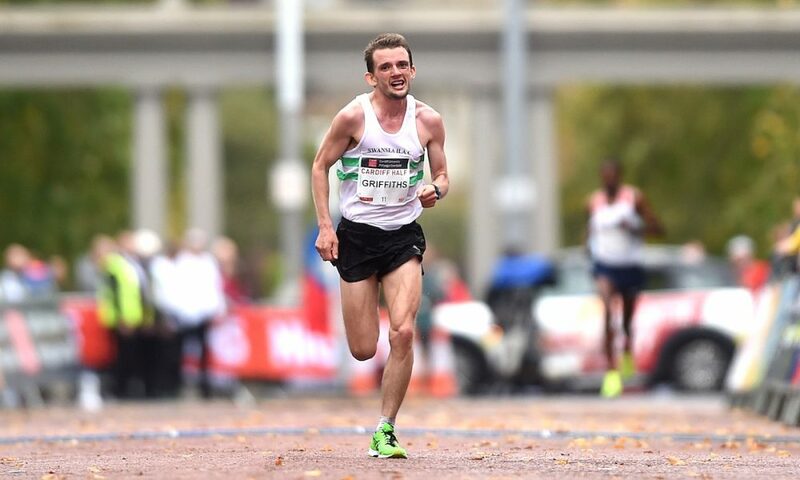 Griffith’s sub-2:10 clocking was the 15th fastest ever marathon time for a British man, and the second fastest in 12 years – second only to a certain Mo Farah, who himself has only managed to run 88 seconds quicker, so far. That incredible run followed on from PBs in every distance from 3000m up to the half marathon, but it was all to come to a sudden and painful end just a month later. Griffiths – whose surname literally and appropriately, considering his steely determination and bossing of his domestic competition, means ‘strong grip’ and ‘chief’ – agonisingly had to drop out of the European cross country championships in Samorin, Slovakia, last December, where he tore his hamstring after leading the race for the first 4km. 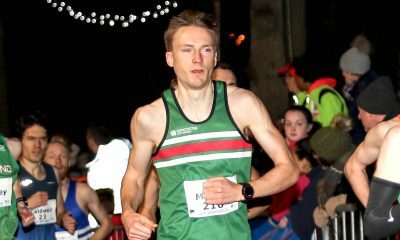 Those injury woes were to continue, although Griffiths started 2018 off with an impressive comeback at the Armagh International 5k in February, posting a 14:07 result to finish a creditable 11th. Alas, he was forced to DNF once again at the Welsh National Cross Country Championships nine days later, with what was to be later diagnosed as a stress fracture in his hip, ending his goal of winning his seventh senior title. Determined not to let this latest setback curtail his running dreams, the farming athlete juggled helping out on his family’s 300 acre livestock farm in Llanfynydd with a rehab programme designed to get him back running, little by little. 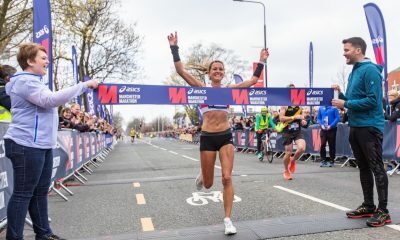 After five months out from racing, the 26 year-old – who turns 27 this week – made an eye-catching comeback in July, taking the win at the hugely competitive British 10k (running 29:41 for victory on the streets of London), before posting a 14:45 parkrun at Swansea Bay. His latest 10k race came at the Barry Island 10k, where he fought off top competition from Matt Clowes and Josh Griffiths to win in 29:41. How has the Swansea man made such a remarkable comeback after sustaining such a potentially serious injury? By taking the long term, little by little approach, says the Welshman. He explains where he is now with his running: “Although I was given the go ahead to crack on with running in early June, I didn’t want to (and was advised not to) rush things and do too much too soon. “I’m currently running six days a week, and hitting up to 70 miles of volume a week. Included in that are two sessions (typically running up to around 8km in volume in intervals) and a longer run of 90 minutes. “My focus is on the long game – the next six months, 12 months, 24 months, the rest of my career – and focusing on being a better overall athlete and not chasing form too much in the short term and jeopardising everything. What did Griffith’s rehab programme look like from the end of February to June? He explains: “Following expert advice, I was aiming to go from being diagnosed with a stress in the ilium (hip) to hopefully be in a position where I’d be pain and injury free and back running most days – in 12 weeks. After this point, me and my coach would take the lead in my training again. “As you’d imagine, I had to be able to complete everything pain-free before being able to move onto the next stage and so on. Taking an extra week if needed to make sure things have healed properly before progressing isn’t the worst thing in life, and could save further complications down the line. “The start of any programme of this nature is rest. Due to having a stress fracture, I was advised to increase my calcium (by eating and drinking more calcium-rich food and drink like milk and yoghurt) and Vitamin K (weeds such as broccoli, spinach and kale!). Both help with bone strength. He continues: “After two weeks of rest I was allowed to start swimming or cycling on a static bike, as long as I was pain free doing so. My swimming isn’t great and I probably wouldn’t back myself to make it from one end of the swimming pool to another without help, so cycling was the only option for me. “Once I’d got to week three, I started doing some bodyweight strength and conditioning, he says. “Again, I could only progress if everything was pain free. At the start, it was about maintaining some muscle mass while starting to engage and move the injured and supporting area. By this I mean doing stuff like single leg calf raises to help maintain calf muscles and doing double leg hip bridges to start to engage the hip area. Week seven was a landmark week for Griffiths, he started to run again – on an Alter G machine. “On the Monday, I ran my first steps on the Alter G, and through the week I was able to progress, so that come Friday I was up to 90% body weight and the next stage was running outside,” he explains. “I also completed several max tests during this week which would shape my S&C programme moving forward. After showing great patience he finally started to run outdoors. “Week eight began with my first easy 30 minute run outside,” he says. “Initially, it was one day on, one day off from running, and over the following weeks I progressed from running two days on, one day off, three days on, one day off, and so on. Griffiths is clear about the importance of regular physio and massage in his comeback from injury: “The key time for this for me was the introduction back to the running phase. Regardless of the work I’d put in during my lay off, the injury side would always be on the weak side to start with, and so my right side would be working harder and get tighter faster than it should. What did Griffiths do to specifically improve strength and mobility around his hip area? He explains: “The main and most important things I’ve done are probably the single leg work, such as the elevated split squat, bridges, and the band work. “I’ve discovered my right glutes don’t fire properly (this was probably a contributing factor to the injury), so after finding this out, I’m now trying to teach my body to start using them instead of relying on surrounding muscles. Griffiths is keen to acknowledge the wealth of support he’s had from the governing athletics bodies to help him regain his enviable speed and strength. “I’ve been fortunate to have great support from both British and Welsh Athletics during my time out, as well as from Sport Wales,” he explains. “I need to express a huge gratitude to everyone who has helped me get back on my feet. Hopefully, I’ll repay them with a special performance one day. Griffiths is keen to share more about his injury comeback experience, and offer up advice to other runners going through the rehab process themselves. We will share the Welsh star’s words of advice later on this week, so keep an eye out for top tips from one of Britain’s greatest ever endurance runners to help you make your own successful return to fitness.